The only antidote to all this venom is his friendship with fellow outcasts Travis and Lydia. But as they are starting their senior year, Dill feels the coils of his future tightening around him. Dill's only escapes are his music and his secret feelings for Lydia neither of which he is brave enough to share. Graduation feels more like an ending to Dill than a beginning. But even before then, he must cope with another ending one that will rock his life to the core. The Goodreads description sums things up pretty well - Dill was raised by a man who's faith was trumped by his desires landing him in jail. His mother, ever loyal, is waiting for the day when her husband is released and believes that her son is better equipped to stock groceries then create a future for himself away from their little town. Dill's salvation lies in his best friends - Lydia, an internet fashion sensation who has big dreams, and Travis, a fantasy fiction loving gentle giant who is content in the world he is living in. The word "serpent" in the title gave me pause, and I most definitely wouldn't have picked it up on my own. You see, I've got this not so small, paralyzing fear of those creatures that shall not me named. There was a mention or two, but I was able to keep my cool. This one surprised me. It was dark, and ugly, and gritty, but at the same time there was a beauty to it. 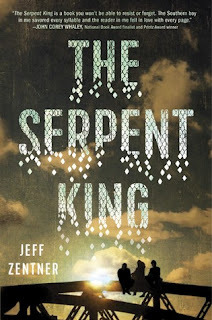 Zentner weaved together three very different characters, characters that didn't belong together, yet found a home in one another. And despite all the ugly, there was a hope in the end. It wasn't a perfect book. There were a few elements of convenience that swayed the story on a particular path, but that was forgiven with genuine development of the people that populated its pages. Kudos to including a parent that was supportive, sincere, and compassionate. Sadly there aren't too many of them in teen fiction. And another gold star for including every reader's dream - a connection with an author who, despite fame and fortune, truly understands the power of the written word and the importance of imagination. This is a hard one that leaves a lump in your throat. I'll never say it was one of my favorite books. Like Eleanor and Park, this one hit a little too close to home with its characters, reminding me of some of the teens that filter into the library every day after school. But it's definitely one I'll recommend to everyone. Everyone has a little ugly in their life. Some more than other. And it can't heart to remind each other that there is hope out there in the distance.